To build a stronger body and increasing your stamina, there are so many type fitness equipment you can use and one of them is a rowing machine. Just like its name, these machines are used in similar manner of rowing by pulling the handle towards your body. In today Stamina ATS vs Concept 2 article, we are going to give you information regarding what you can expect from these two similar yet different machines. If one or both of them took your attention, go check our article below. If you are not familiar with rowing machine yet, these kind of machines is great for toning and building muscles as well as increasing stamina. Its movement in your body will give an impact on several major muscle groups while you will still able to develop your lower body. One reliable and popular rowing machine you can count on and affordable enough not to hurt your bank account is the Stamina ATS. It will provide you with everything you need from a rowing machine but still leaves some to wish for. From the outside, there is nothing special about the rowing machine and it looks just like any other air rower with its wind resistance located at one side of the slide. This model comes in a combination of high quality material that can stand user with weigh up to 250 pounds and a simple color scheme; black, silver and white for the wind resistance cover. It has seat where you will place yourself when you do your exercise and s pair of pedal. Read also: Stamina ATS vs Stamina X here. As it has been mentioned earlier, the Stamina ATS is an air rower, which means it uses wind resistance. This type of resistance will not let you to adjust the power or how hard the resistance is in the machine through some type of adjustment. However, you don’t have to worry because the machine will suit the hardness depend on your exercise. To put it simply, if you row slower, the resistance will also lighter while if you want some more intense exercise, you can start rowing faster. Using Stamina ATS is also very simple and you can start right away. First you have to sit yourself in the seat and place your foot in the pedal then fasten the strap to secure your feet and make it stay in its place while you do your exercise. The seat is well padded and pretty comfortable when used. Then you can start pulling the handlebar towards your body slowly to let your body getting used to it first. Located at the top where the handlebar is placed, you can find a small LCD screen. The screen is useful and can deliver you information like speed, distance, time, and calories, so you can track your exercise easier. What’s lacking here is the LCD screen size, since it is quite small and it can get hard to see while you are pulling the handlebar. It also can be better if the company also added another function like heart rate monitor to the machine. If you are not satisfied with an entry model like Stamina ATS or you want a more powerful air rower machine with more capabilities and you don’t mind spending a lot more, you may want to take a look at Concept 2 air rower and this one in our article, is the Model D. This commercial grade air rower is build with high quality material that makes it indestructible and versatile enough for health clubs or other training facilities. From the outside, this air rowing machine already screams durability with its black color made from high quality material. This machine can be used by users with body weight up to 500 pounds, so it can accommodate wider people especially those with bigger bodies. The wind resistance is placed in a higher elevation than where you sit but the handlebar is located at the perfect place for you to pull. The seat is also comfortable enough to use with a pair of pedal and strap to secure your feet. 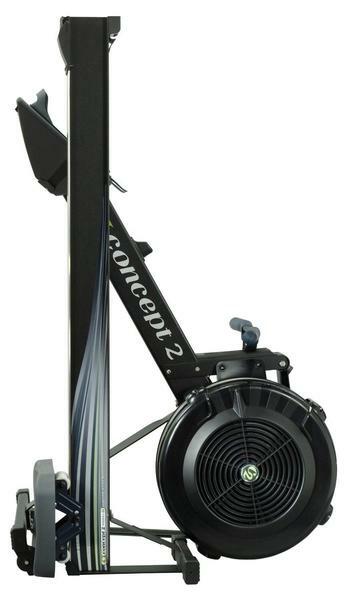 As an air rower, Concept 2 resistance is determined by the flywheel spins and you can’t adjust the power by a setting. This system works by pulling a handle and spinning a fan flywheel. While the flywheel spins, it will need to displace the air in front of it, which is the resistance. So, it is not that you can’t adjust the resistance but it will depends on how hard you row. If you just starting, it is better to row slower, so the resistance will be lighter while harder rowing also means heavier resistance. Unlike many other similar machines, Concept 2 has damper settings, which you can use to adjust the level from 1 to 10. 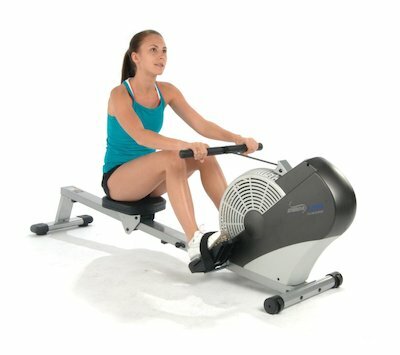 It may sounds like an adjustable resistance but it is actually different because the level doesn’t represent how hard or easy it is but to represent the amount of air going into the flywheel that affects the feel of the rowing stroke similar like those bike gears that affect your feel while pedaling. Level 6 to 10 will give you slower and heavier boats feeling. Concept 2 also comes with Performance Monitor 5 loaded with options far beyond many in its class. It can tracks distance, 500m split (speed), time, strokes per minute, calories, watts, and many more including the average of all of those metrics. It also suitable with heart rate attachment, so you can view your heart rate directly in monitor. Now, let’s compare Stamina ATS with Concept 2. Even though both of them use air resistance, Concept 2 comes with damper settings that you can use to adjust the rowing feel. Concept 2 also has a far better monitor that won’t even feel exaggerating when called as training partner because it is packed with so many information. All in all, the decision is all yours to make. 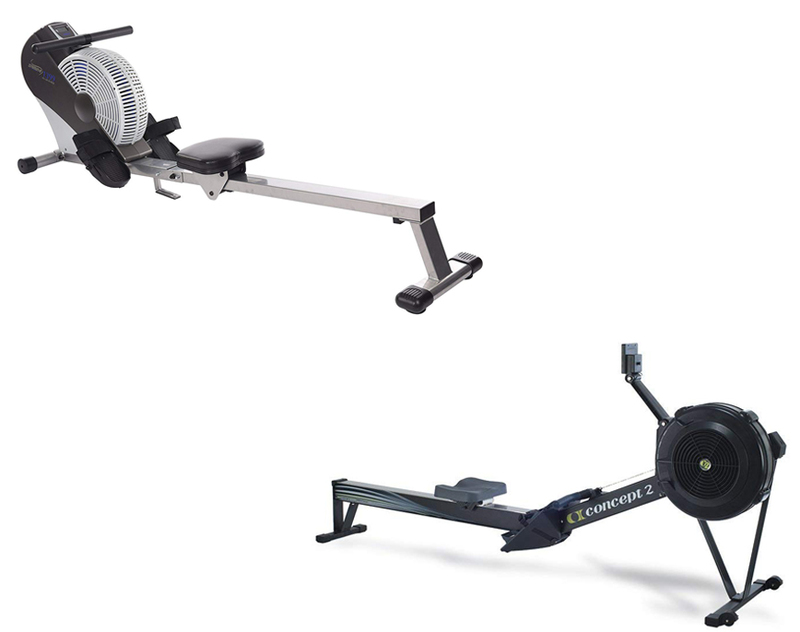 In our opinion, both of them are good but when it comes to say which air rowing machine is better we will say it is Concept 2. If you don’t mind about the price and want to get as much information from your machine, we will recommend you Concept 2.